As you may be aware, the Center for Medicare and Medicaid Services (CMS) published the 266-page Prospective Payment System and Consolidated Billing for Skilled Nursing Facilities (SNF) Proposed Rule for FY 2019 on Friday, April 27th. Included in the Rule is the annual payment update for SNF PPS rates, updates to the SNF Value-Based Purchasing Program and the SNF Quality Reporting Program, and the introduction of the Patient Driven Payment Model (PDPM). This document (the Proposed Rule) will be referred to as CMS-1696-P. You can find the full version of the Proposed Rule at: Full Version. In 2017, CMS published the Advanced Notice of Proposed Rule Making (ANPRM) which introduced the Resident Classification System – Version I (RCS-I) to the industry. The RCS‐I was developed as a result of the combined efforts of Acumen, a consulting group hired by CMS, and an interdisciplinary technical expert panel. Following publication, CMS began accepting comments. RCS-I would fundamentally change the way long-term care providers are reimbursed for the Part A post-acute care skilled services. For that reason, many different entities had varying opinions on RCS-I. As recently as the February 2018 SNF Open Door Forum (ODF), CMS was continuing to solicit comments on RCS-I even though the comment period was closed. This signaled to many of us that CMS was not happy with RCS-I in its proposed published form. In that ODF, John Kane, SNF Team Lead at CMS, said that there was no timeline for RCS-I. This, it turns out, foreshadowed RCS-I’s fate, which is that it has been scrapped (at least in part) for a new model by a different name. This new proposed model, PDPM, was introduced Friday afternoon as part of this year’s SNF PPS Proposed Rule. This Initial Review was created after spending the last several days reading through and studying this release. The purpose of this Initial Review document is to discuss the important components of the new PDPM in order to educate readers on how SNFs will be reimbursed for Part A service if/when this new model goes from proposed to final rule. Over the years, Medicare, MedPac, Congress, and various other stakeholders have been pushing to move the payment system away from counting therapy minutes to instead reimbursing SNFs based on patient characteristics and/or patient outcomes. The new PDPM will pay for SNF PPS-care based on patient characteristics and not a volume of services provided. The current RUGs-IV system is a case-mix index-maximizing system. In this system, as patients qualify for various RUGs (of the 66 RUGs available), then the system automatically assigns the highest paying RUG for each patient’s reimbursement. This is almost always a Rehab RUG (over 90 percent of SNF PPS days were reimbursed via one of the Rehab RUGs per CMS-1696-P). In the new PDPM, case-mix indexing will still play a role, but there are several different components that will contribute to the reimbursement that will ultimately equal the patient’s daily rate, or per diem. They are: PT component, OT component, SLP component, Nursing component, Non-Therapy Ancillary component, and the Non Case-Mix component. The first five of which will be case-mix adjusted based on patient characteristics, and the last will be a flat rate. In order to capture the inpatient surgical procedure, CMS is requiring providers to use an ICD-10-PCS code corresponding to the surgical procedure in the second line on I8000. If this proposal is finalized, then CMS will provide an ICD-10-PCS map of procedures to PDPM clinical categories. The scores for each of the Section GG items above will be added together to get a Total Function Score. This score will be used in Table 21 to further place the patient into the appropriate Case-mix Classification Group. 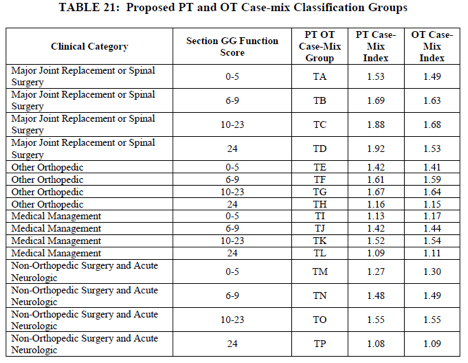 As you may recall, the RCS-I proposal included cognitive status as a determinant for the PT/OT case-mix classification. Due to comments in response to ANPRM, CMS has since removed cognitive status as a determinant of the PT and OT case-mix classification. CMS uses a Classification and Regression Trees (CART) algorithm to help determine the resident groups and cognition was included as an independent variable in the CART analysis. 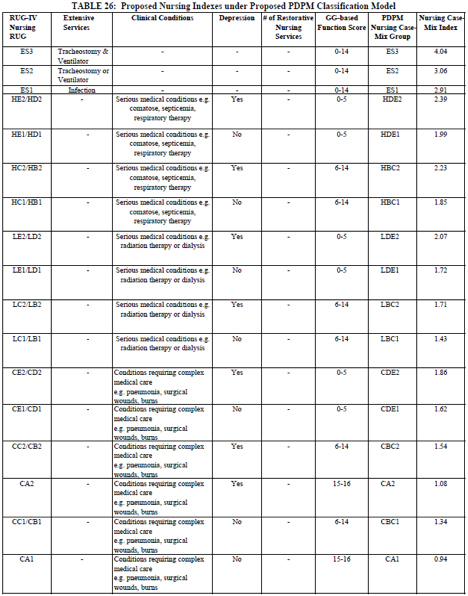 For more information on the CART analysis refer to page 93 of the CMS-1696-P document. Speech Language Pathology case-mix classification will follow the same methodology as the PT and OT classification. Initially, it will be determined if the primary clinical reason for the SNF stay is either “Acute Neurologic” or “Non-Neurologic”. A quick review of Table 14 above shows that “Acute Neurologic” has its own category and “Non-Neurologic” would be comprised of the 9 remaining categories. The second characteristic to be identified for the SLP Case-mix Classification is the presence of a swallowing disorder or mechanically altered diet. It is noted that there is increased provider cost for residents with either a mechanically altered diet or a swallowing disorder. And a further increase in cost if the resident has both. Therefore, “both”, “either”, or “neither” are used as it relates to swallowing disorder and mechanically altered diet when determining the SLP Case-mix Classification. These would be identified by responses to K0100Z (swallowing disorder) and K0510C2 (mechanically-altered diet) on the MDS. CMS explained that there was a significant increase in nursing cost to provide care for residents with HIV/AIDS. To compensate facilities for caring for these residents, CMS proposes an 18% increase in the nursing component. This increase would be applied based on the presence of ICD-10-CM code B20 on the SNF claim. The final piece of the total per diem is the non case-mix component. This flat-rate component (that is not case-mix adjusted) is for covering room and board, capital expenses, and administrative overhead. Combining all 6 components above (PT, OT, SLP, Nursing, NTA, Non Case-Mix) will result in the base daily rate for that patient. Multiplying each component’s base rate by its respective case-mix index will return the facility’s daily rate for that specific resident upon admission. As will be discussed below, the Variable Per Diem Adjustment Factor comes in play with PT, OT and the NTA components. These components will be decreased at various intervals during the resident’s stay. Discussed in both the ANPRM and CSM-1696-P documents, is Medicare’s discovery of decreasing costs of PT, OT, and NTA the longer the resident stays in the facility. This discussion can be found throughout the CMS-1696-P document. Due to the decreasing costs during a resident stay, CMS proposes the Variable Per Diem Adjustment Factor. For PT and OT, the PDPM proposes that the facility be reimbursed the full base rate multiplied by the the case-mix index, for each resident for PPS days 1-20. Then, starting on day 21, a decreasing adjustment factor of 2% every 7 PPS days would be applied. Days 21-27: PT base rate x CMI x .98 (the initial adjustment factor) = PT portion of the per diem. This decrease would continue for both PT and OT every 7 days as outlined in Table 30 until the patient is discharged. It is worth noting that if the resident stayed all 100 days, the PT and OT components would be reimbursed at 76% of their initial rate for days 98-100. (2) The change(s) are such that the resident would not be expected to return to his or her original clinical status within a 14-day period. In last year’s ANPRM document, CMS proposed keeping the Significant Change assessment and is now proposing that the Significant Change assessment be replaced by the IPA. CMS has also proposed a change in the rules governing when a PPS Discharge Assessment is to be completed and the Assessment’s Item Set. Currently, the PPS Discharge Assessment is completed when a patient is discharged from Part A and continues to stay in the facility. CMS is proposing the completion of the PPS Discharge Assessment for all residents who are discharged from PPS; whether they are actually discharged from the facility or stay long term. 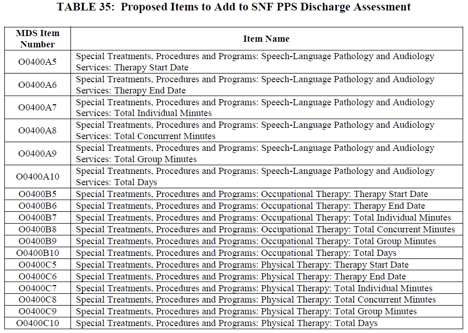 Additionally, CMS is proposing to change the Discharge Assessment Item Set to include a modified Section O. It appears that the added “Total” items (total individual minutes, total concurrent minutes, total group minutes, total days) may be referring to totals throughout the resident’s stay and not just in the 7-day look-back period. As of this writing, this has not been confirmed and the CMS-1696-P document is not explicitly clear on this issue. Note: In the current MDS 3.0, RUGs-IV Model the 5-day assessment window is days 1-5 with allowable grace days 6-8. CMS is proposing the removal of the label “Grace Days” from the 5-day assessment window. The scheduled assessment window for the 5-day assessment will now be identified as days 1-8 of the PPS stay. Even though we will no longer be using therapy days, modes, and minutes to determine payment, CMS will continue to track these items and will be placing additional constraints on therapy providers. It is expected that the majority of therapy provided will be in the individual mode. To that end, CMS is expanding the group limitation to include concurrent therapy as well. That is, CMS is proposing limiting group and concurrent treatment provided to a resident to 25% of the minutes provided per discipline. This, again, was in response to stakeholder comments where there was concern that a large portion of therapy would now be provided in a group or concurrent setting. Additionally, CMS is going to allow the entire provision of minutes provided in group and concurrent to be recorded on the MDS, which differs from the current RUGs-IV system where the Reimbursable Therapy Minutes are calculated by the group (one fourth) and concurrent (one half) reduction. Should your therapy department provide more than the allowed 25% of group and concurrent per discipline, the provider would receive a non-fatal warning edit on the validation report after submitting an MDS to the QIES ASAP system. This would serve to alert the provider that the modes utilized in the provision of therapy were such that they exceeded the 25% limitation. Note, this would not be a fatal error which indicates that one or more submitted items failed to pass the requirements identified in the MDS. CMS indicates that they will monitor group and concurrent utilization and consider making future proposals to address abuses of this policy or flag providers for additional review. The interrupted stay policy outlined in last year’s ANPRM lives on in its proposed form. The interrupted stay policy is proposed to relieve any incentive for providers to discharge a resident with the intent of bringing them back into the facility in a few days in order to reset the Variable Per Diem Adjustment Factors. In the interrupted stay policy, a resident’s PPS calendar will resume with the next PPS day if the resident returns to the facility within 3 midnights (the midnight of the day of discharge counts as one of these three). In cases where the resident returns within this timeframe, there would be no new 5-day Assessment, nor would the Variable Per Diem Adjustment Factor be reset. The resident would return and the payment schedule would continue on the next PPS day continuing with the Variable Per Diem Adjustment Factors in place. This only applies if the resident is out of the facility for less than 3 days. If the resident returns on day 4 or later or is sent to a different facility, then the Variable Per Diem Adjustment Factors are to be reset to day 1 and a 5-day assessment would be required. In an effort to help make the proposed PDPM clearer, let’s take a look at an example of how the per diem will be calculated under the PDPM: Mr. B is a hip replacement patient and has a PT and OT Case-Mix Group of TB, SLP Case-Mix Group of SA, Nursing PDPM Case-Mix Group of CDE2, NTA of NE, and a flat non case-mix rate. The following calculations determine the facility’s per diem covering Days 1-3 for Mr. B’s care. 1. Electronically. You may submit electronic comments on this regulation to http://www.regulations.gov. Follow the "Submit a comment" instructions. As you may be thinking, this new model will have large implications for all types of long-term care providers. The review you have just read comprised our initial summary of PDPM, but as we spend more time with the model other issues and nuances will come to light over the coming months. PDPM is something that we, as an industry, will discuss and address in order to successfully navigate the changing regulations. We will be doing just that in various settings over the next year and a half. If you are not already a regular client, please visit our website (seagroverehab.com) and sign up to be informed about any updates. We will most likely host a webinar on this topic, and if you attend any therapy-related conferences, keep an eye out for Mark’s sessions. He is a scheduled speaker at American Health Tech’s customer symposium this May and may be speaking at other state and national association meetings near you (i.e. he has spoken at AANAC’s annual conference the last several years). In the meantime, should you or someone in your facility have questions about the new model, please feel free to reach out to us. We welcome the opportunity to create a partnership between our teams. Seagrove Consulting Group, LLC (dba Seagrove Rehab Partners) is a national healthcare consulting company headquartered in Santa Rosa Beach, Florida. Our mission is to serve the therapy industry by providing a compassionate, people-centered approach to compliance and management support, including a proprietary solution for in-house therapy programs. We believe that a thoughtful strategy not only helps our partners to be more compliant and profitable, but also puts the patient first. Mark McDavid, president, and our 10+ company associates are available to work with skilled nursing facilities, rehabilitation companies, and other healthcare providers at the client site, by phone, by email, by video conference call and through workshops and seminars.